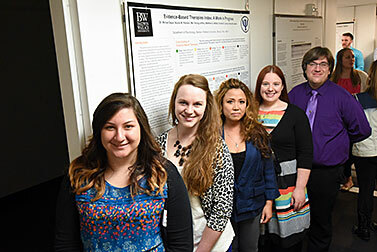 Erika Davidson of East Aurora (14052), a graduate of East Aurora High School majoring in chemistry, presented a poster titled "Initial Steps in the Synthesis and Reactions of Novel Cyclopentadienone Iron Complexes." Sydney Howard of Fairport (14450), a graduate of Fairport High School majoring in music theatre, gave a performance titled "Guns, A Music Theatre Song Cycle." Elena Jackson of Mendon (14506), a graduate of Honeoye Falls-Lima High School, presented a poster titled "Pets and Social Rejection." Jeffrey Jaskolka of Boston (14025), a graduate of Hamburg Senior High School, gave a performance titled "Transcription and Performance Practice on Ottaviano Petrucci's Odechaton: Marbrianus de Orto's Ave Maria." Bridget Kline of Henrietta (14467), a graduate of Rush-Henrietta Senior High School majoring in theatre design and technical studies and French, presented a poster titled "Science and Religion on the topic of Genetic Modification." Paige Lindauer of Buffalo (14221), a graduate of Williamsville High School South, presented a poster titled "Bridging the Gap for Refugee Children: Promoting Native Language (L1) Literacy Through Parent-child Book Reading." Alyssa Smith of Hilton (14468), a graduate of Hilton Central High School, presented a poster titled "Exhibit on World War I."